In Cue & A, music supervisors guide us through the record collections of our favorite television shows. Liza Richardson has racked up an incredible number of credits over the past 20 years for her music supervision on such shows as Narcos, Parenthood, and Friday Night Lights. On Friday Night Lights, she worked alongside director Peter Berg, with whom she also works on The Leftovers, Damon Lindelof and Tom Perrotta’s often bleak adaptation of Perrotta’s 2011 novel. 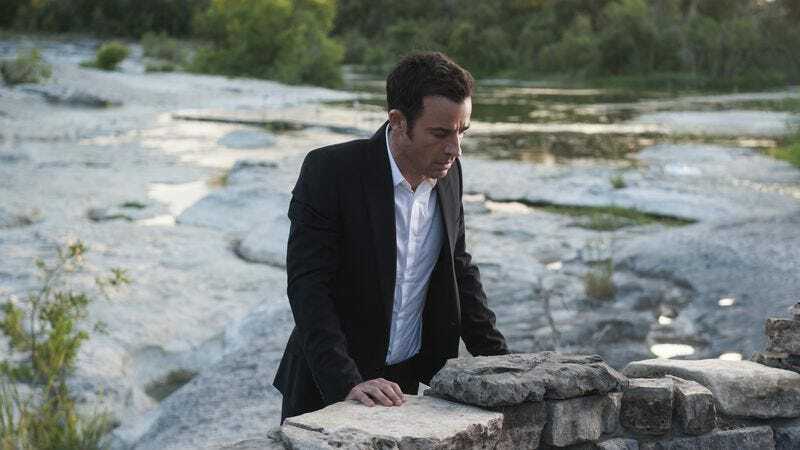 The second season moves the action from upstate New York to Jarden, Texas, the only town spared from a global phenomenon in which millions of people inexplicably vanished, a reshuffling that gave Richardson new challenges in choosing the show’s pop music cues. This interview covers the music from season two, and it discusses major plot points in detail. The A.V. Club: In your working relationship with Damon, do you generate most of the musical ideas, or do they usually come from him? How specific are the notes you get? So let’s say we have a gospel song and Damon has temped in something he found on YouTube or something like that. Then my team and I will find something like that that’s totally licensable, because a lot of old gospel and old music is difficult to license and difficult to find. But we have our sources that can license authentic music that fits our needs, so we just solve the problem. Sometimes it’s one idea that sticks, sometimes it’s trying a bunch of ideas to see if they fit in the same way as what was temped. Sometimes they’ll say “We need some dubstep here,” or “We need some angry dubstep here.” Sometimes we work with picture, sometimes we’re working before they’ve got picture. AVC: In an interview about season one, you said Damon told you he wanted the music to be really dark. Did you get a new set of marching orders for this season, which has a different tone than the first one? LR: All the creative juice comes from Damon. Many of the music ideas are scripted, so I pretty much follow his lead. He says that he was in a different mood this season, so obviously that affected the outcome of the show in general and the music as well. AVC: Were you looking for things that were more upbeat or hopeful? LR: Not necessarily, just whatever the scene calls for. In some cases, sure. But there’s plenty of darkness too. The scene: DeMent’s folksy riff on life, death, and the great beyond accompanies the The Leftovers’ completely reimagined opening credit sequence. LR: This was one of Damon’s ideas where he knew exactly what he wanted. AVC: Is it more expensive to use a song as a title theme versus a typical placement within an episode? LR: It all depends. If it was The Who, it would more expensive to use it in a main title, but if it’s an independent artist like Iris DeMent, it’s probably about the same price for each use that it would be for use in the body of the episode. With that song, we made a deal per use, and we may have gotten a discount because we used it so many times. The scene: In a disorienting, wordless opening scene, a pregnant prehistoric woman gives birth after her tribe is decimated by a cave collapse. AVC: This is such a jarring way to open the episode. How did you decide on this piece as opposed to using score or foregoing music entirely? LR: We thought about scoring it, but we thought it would make a bigger statement with a piece of music that was licensed. We wanted it to maybe seem a little like score, but have a different quality to it so you can tell it’s not score. There were a lot of pieces we could have used, but we didn’t present alternate ideas for that one. We just tried it in editorial and it stuck. The scene: Kevin (Justin Theroux) becomes increasingly unglued due to the presence of Patti (Ann Dowd), who stalks his every move despite having died already. LR: Often people will ask me why a song was chosen and I don’t always have a good answer for it. You try ideas and something works or sounds really cool. Sometimes songs are on the nose and sometimes they’re more mysterious. But obviously Kevin is losing his mind, so “Where Is My Mind” came to mind. We tried it and it worked, so it’s frequently a gut thing. AVC: Generally speaking, do you think it’s a valid criticism to say a song is “too on the nose” for a particular scene? LR: I think it can be. Sometimes you love on-the-nose ideas, and sometimes they’re horrible, but this was one we really liked. The scene: The song plays over the end credits, just after Tommy (Chris Zylka) is seen reinventing himself as a faith healer to help lead lost souls away from chain-smoking cult the Guilty Remnant. AVC: I saw a pre-air version of this episode in which Nina Simone’s cover of “Suzanne” played the episode out instead of the Tangled Eye tune. Was that a budgetary issue or a creative choice? LR: Nina was way, way, way out of our budget. That song would have taken us over budget by almost 50 percent. Damon loved that song, and it was his idea, but he wasn’t married to it. There are certain things he’ll go to the ends of the earth to fight for, but there are times when he’s willing to say, “No problem.” It was the end credits, so it wasn’t telling the story. It made a great cap to the episode, but it wasn’t absolutely necessary to keep it in. The scene: Patti, who is never at a loss for ideas on how to best torment Kevin, Rickrolls him as a reminder that she will continue to haunt him indefinitely. AVC: This has to be a pretty expensive song to licensed—was it any cheaper because Patti is singing it? LR: Yes and no. If you see somebody singing on a song on camera, it’s more expensive because it’s married to picture and you can’t change it. So you have to clear the song before it’s shot, and you have to get permission before they start shooting the episode and the actors start working with the song. There are different types of music uses: background instrumental, background vocal, end credit, main title, and visual vocal. We report those usages to ASCAP and BMI, who collect the publishing money for the artists. A visual vocal is tied to picture, as opposed to something you could change if you had to. So they sometimes cost more, and sometimes a lot more. We licensed that song for four uses because originally the script called for Patti to sing it that many times, but we ended up only using it twice. It’s pretty pricey, but she’s singing it a cappella, not to the song on the radio, so we’re not paying for the master recording, we’re only paying for the publishing. AVC: So when the publisher knows they have you by the short hairs, they get as much as they can. The scene: Matt (Christopher Eccleston) attends to his catatonic wife Mary (Janel Moloney), and the song plays repeatedly to underscore the drudgery of Matt’s daily routine. AVC: This was a placement for a song that has to play over and over without becoming too irritating. Did you come in with a lot of ideas for it? LR: I can’t remember if I pitched other ideas for that one, but we wanted something that was kind of country/Top 40 from the ’70s, and that’s just the one we landed on. It turned out pretty cool. The scene: The residents of Jarden hold a vigil for Evie (Jasmin Savoy Brown) and the two other teenage girls who went missing under mysterious circumstances. Rihanna plays over a slideshow of the girls during simpler times, but Erika (Regina King) stops it in order to thwart a local man’s macabre ritual. LR: That song is really expensive and I tried to present other ideas, but Damon really didn’t want to lose that song. We went a little over budget on that episode but we had a bit of savings by then, and Damon promised me that episode eight would have very little music. Eight’s the one with that one incredible piece of music over and over. He promised we’d save money in eight so we were able to spend the money on Rihanna in episode six. The scene: The song plays with the end credits after Erika lobs a rock through a window and into the living room of Nora, who had done the same to her hours before. AVC: I’d imagine many artists of this caliber are concerned about legacy and are pickier about how the music is used and in what context. Did you get any pushback on this one? LR: No. It was expensive, but I’ve known Paul Simon’s management for many years, and they’re great. They got back to me very quickly. They’re very careful, and they’re not going to allow a poor use of their music, but I didn’t really get any denials in this show for creative reasons. Sometimes songs were denied for other reasons like the publishing didn’t add up, or there was a publishing dispute of some kind, and those are the things you have to worry about as a music supervisor. But creatively I didn’t get any pushback, and I thought that song was a great and clever choice to end that episode. AVC: So the advantage of working on a thoughtful, well-written show is that it’s easier to pitch to the artists. LR: Yeah, if it’s a show that hasn’t even premiered yet, you get more denials than you would if it was on the air already. Sometimes people just want to know if it’s legit, and it doesn’t even have to be a great show. But I do get calls sometimes from licensers when something doesn’t work out with an artist. For instance, Florence And The Machine. We didn’t use her, but we wanted to, and she has a specific list of shows that she would say yes to if they asked, and for anyone else, it’s a no. We were trying to find a place for Florence because I got the message that she liked our show, but it didn’t work out. But generally if it’s a show that hasn’t aired yet, and my producers want U2, I say “We’re not going to get U2” because we have absolutely no history or legacy yet. The chances of getting U2 are hard enough in general, even for an established show or a film, whether we can afford it or not. But with many songs, the artists are fine with us using the music, and we love those people. Other times people are really picky about it, and I respect that. They’re doing us a favor, no matter what the price is. Simon & Garfunkel don’t need the money. It was a lot of money, but they didn’t do it for that. Overall, most people let their music be used because they’re into the idea for creative reasons. Even with indie artists, it’s not about the money. If we license an indie song and pay $2,000, by the time that gets divided up, it’s not that much money going to the artist. A couple hundred bucks isn’t incentive, but if an indie artist is getting Shazamed a lot, that can be huge for them. The scene: The song plays with the end credits after Kevin returns to his body from the otherworldly hotel where he did battle with Patti. AVC: This is the episode where Damon let you save some money after breaking the bank with Rihanna. Is the Tuskegee Institute Singers piece one you can use cheaply because it’s an old traditional song? LR: Yes, that’s a public domain song, but this one wound up being kind of confusing. It’s actually a medley of two songs, “I’ve Been ’Buked And I’ve Been Scorned” and “Most Done Traveling.” The production company makes us prove a song like that is public domain before we can use it. We could totally prove that “I’ve Been ’Buked” was in the public domain, but we couldn’t find enough publishing information on “Most Done Traveling.” Oh my God, we did so much research to try to figure out if it was public domain, because it appeared to be, but we couldn’t prove it. So what we did is just edit “Most Done Traveling” out of it completely. It’s a recording we licensed from The Smithsonian Institute for $4,000. But again, those prices change all the time. It’s not like I could get that price for a commercial or a film, or even a future episode of The Leftovers. Nothing like that is set in stone. The scene: Meg (Liv Tyler) does cocaine in the bathroom to help her through a lunch date with her overbearing mother, who ends up dying while Meg is away from the table. The scene: The song, which was written expressly for the show, is performed several times throughout the season as a tribute to the town that was spared in the Sudden Departure. In the finale, Meg and Evie reprise the song in creepy two-part harmony after Jarden has been overrun by members of the Guilty Remnant. LR: That was done by our composer Max Richter, who wrote the music, and one of our head writers, Tom Perrotta, who wrote the lyrics. I love it. AVC: How did that responsibility end up falling to them? LR: That’s such a key song for the season and a major part of the story that we were going to be using over and over. So we needed something created for the show, and why not go to the composer and writers? But that’s an exception. A lot of times there will be little source problems that composers can easily solve, but I try to shield them from having to deal with that work. If it’s not part of the score, I feel like that falls to my responsibility. Sometimes we ask Max to do things like the “Miracle Anthem,” but I try to make sure he’s not overloaded. The scene: In his second journey into the beyond, Kevin ends up back in the purgatory hotel and must sing “Homeward Bound” at the hotel bar’s karaoke night to get back to his family. LR: This calls back to “I Am A Rock,” and we kind of wanted that to set up “Homeward Bound” in the finale. I don’t know if it does that trick, but we made that connection in our minds. I was really happy about our karaoke stuff, because we wanted to find songs that had meaning. Originally, there were supposed to be three songs performed in that scene: “All My Ex’s Live In Texas,” “Angel Of The Morning,” and “Homeward Bound.” We wound up only using the last two, and the first one was cut. But it worked out really well because we got songs that helped to tell the story but still worked for our budget. The number one success in music supervision is when you can satisfy everybody on every level, creatively and in terms of the budget. That’s when I’m most stoked, when we can balance the left-brained stuff and the right-brained stuff.